Carondelet Reef is a horseshoe-shaped reef of the Phoenix Islands, also known as the Rawaki Islands, in the Republic of Kiribati. It is located 106 km southeast of Nikumaroro, at 05°34′S 173°51′W﻿ / ﻿5.567°S 173.850°W﻿ / -5.567; -173.850, and has a least depth of 1.8 meters. It is reported to be approximately 1.5 km in length. The sea occasionally breaks over it. Carondelet Reef was named after the vessel which reported it in about 1899. The multiple positions of Winslow Reef, mentioned by Robert Louis Stevenson, may have been due to confusing the position of Carondelet Reef with Winslow Reef. The reef is part of the Phoenix Islands Protected Area as an underwater nature reserve. ^ Mike Pearson; Jonathan Willis-Richards. 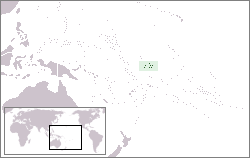 "Islands of Kiribati". Archived from the original on 2006-12-31. Retrieved 2007-02-21. ^ W. J. L. Wharton (May 26, 1903). "Notices to Mariners". London Gazette. London. Retrieved 2015-12-27. This Kiribati location article is a stub. You can help Wikipedia by expanding it. This page was last edited on 23 March 2019, at 23:25 (UTC).